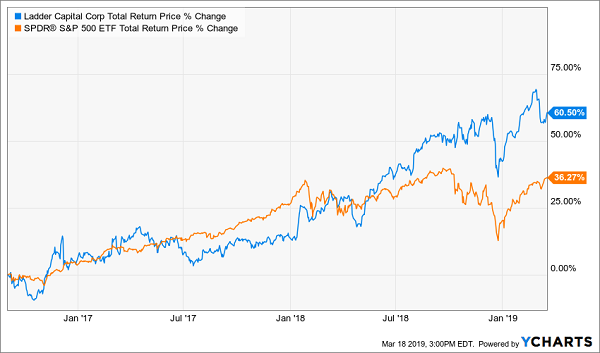 Defensive dividend-paying stocks and generous bonds are your “dividend lifeboats” when the markets get rough. That’s because their massive payouts give you more of your profits in cash, rather than paper gains that are here today, gone tomorrow. 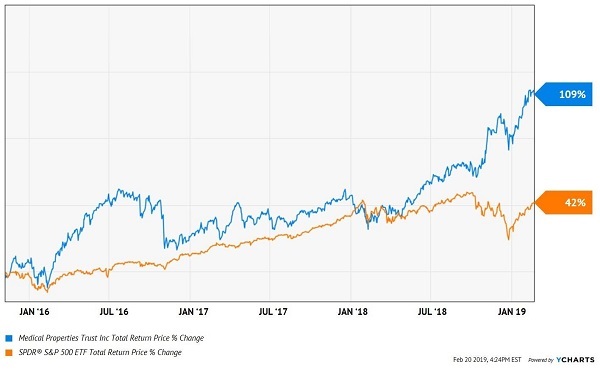 But investing is like basketball. The best defense is a good offense, where a 100%+ gain makes up for a lot of mistakes! And all of the buckets I’ve outlined above not only pay 6%, 7% or more–but all six also boast investments with the potential to double your money. 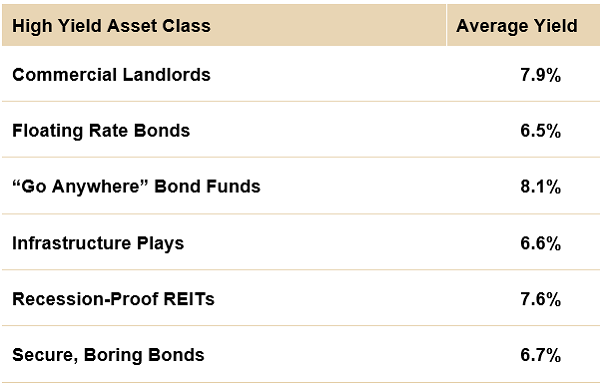 Hospital landlord Medical Properties Trust (MPW) is a great example of a recession-proof REIT. As I mentioned earlier, hospitals are constantly in demand. And since 2003, this firm has been acquiring US hospital properties at favorable prices. The result? A stream of rent checks that have translated into an ever-increasing flow of dividends. But MPW doesn’t always get the respect from Wall Street that it deserves. My CIR subscribers took advantage of a misunderstanding and bought shares in November 2015 when the out-of-favor stock was paying more than 8%. Its dividend has since become quite popular with retirees. We benefited with 109% gains that we recently cashed in! Looking for the next MPW? An 8% payer with 100% upside? Here are 19 ideas for you. I’ve got 19 life-changing dividend plays to give you. 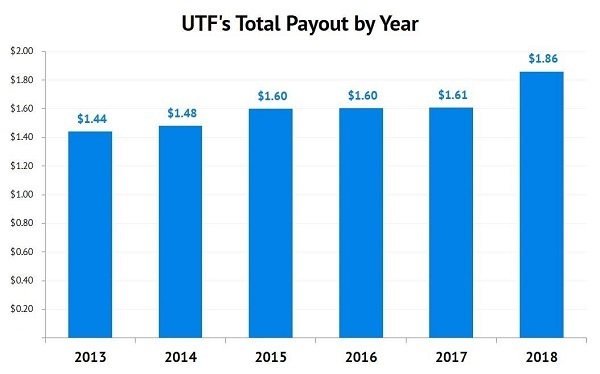 I’m talking 7% to 8% cash payouts, on average—enough to let you retire on dividends alone with a $500k nest egg, thanks to the $40,000 yearly income stream these defensive superstars give you. That’s why I call this my “8% No-Withdrawal Portfolio.” I can’t wait to show it to you. 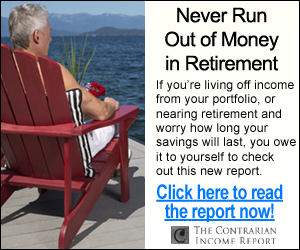 Because I just released a new issue of my Contrarian Income Report newsletter, with fresh updates on the 19 stocks and funds in our service’s portfolio, which hands our savvy CIR members massive yields up to 11%! I want to send all 19 of these cash-rich plays your way, too. This latest issue just went out to members a few days ago, and your copy is waiting for you now. Don’t miss out. 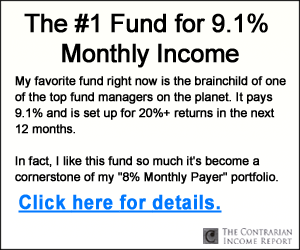 Click here and I’ll give you INSTANT access to my 8% No-Withdrawal portfolio and the latest issue of Contrarian Income Report, with its 19 powerhouse income plays (yields up to 11%).